Sunday Tittle Tattle: Bad Books and Dog Baths. 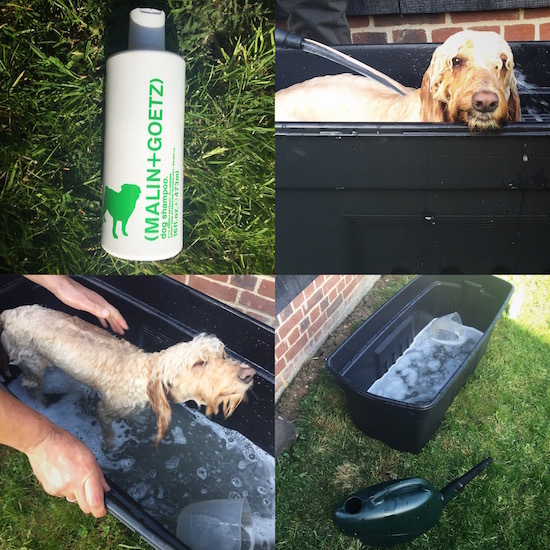 1) During the mini heatwave last week, we decided to give Dexter the Dog a bath in the garden. We can’t very well bath him in the actual bath where we are because it’s a holiday let, and he’s not allowed upstairs, and anyway it’s kind of gross to do that when other people will use the bath in the future! So Mr AMR bought a plastic bath from Wickes so that we could splash the dog about on the lawn and not worry about dirtying the floor tiles and making a mess. 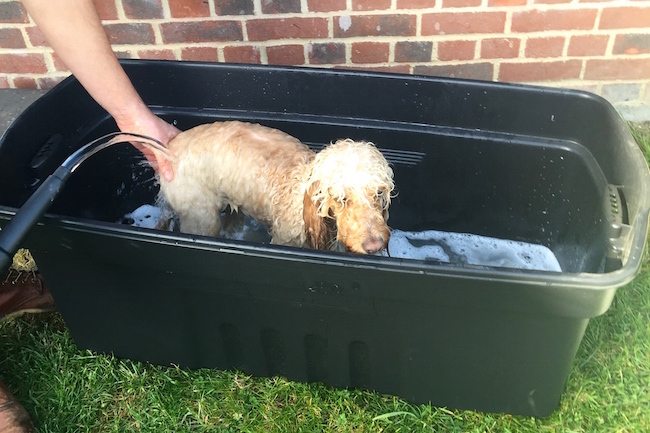 It’s actually not a bath at all – the dedicated dog baths we found online all seemed really expensive for what they were, so Mr AMR found a large plastic storage trunk that was just the right shape and size. If you want to take a look, it’s here on Wickes – you can get them elsewhere online in different colours, but this seems to be the cheapest. We have also been trying out a new dog shampoo – Paul Mitchell’s one was brilliant and gentle, but the Neroli one from Malin + Goetz (here) smells absolutely amazing! Bit of a luxury item, but so many dog shampoos smell of blueberry muffins and other hideously sweet things… By the way, Dexter is much better – thanks to all those who asked. We still don’t know what caused his tummy upset, but he’s eating well again, so hopefully it was a one-off. **UPDATE: since writing this, Dexter has been back to the vets for the same thing. Still not sure what it is, but I shall keep you in the loop, if you’re interested. Sorry for lack of pictures in this post, life is quite hectic! 2) “Hausfrau”. I was lured in by a Sunday Times write-up of the novel Hausfrai and bought it full price, hardback. It’s one of the worst things I’ve read in years. I’m actually wondering whether I might return it, as I have only skim read most of it to see if it got any better! I have never returned a book in my life, I don’t think, but this was so bad it made me cross. Actually it’s not that the writing is bad, it’s just that it’s so depressing and dull! It’s like listening to one of those friends who always has the same problem but never wants to do anything to fix it and they drone on and on until you want to stab yourself in the throat with a fork. I have a feeling that something drastic might happen at the end of the novel to perk things up, but to be quite honest I couldn’t have cared less. If you want my opinion, take it off the wishlist! Other big disappointment this year: The Farm by Tom Rob Smith. His Child 44 – a thriller set in Moscow under Stalin’s regime – is absolutely amazing, and I’d highly recommend that (and the sequels) if you’re stuck for something to read, but I found The Farm dire. The plot was a let-down and there was an annoying writing style that flitted between the son and a mother who may or may not have been mad… You can find Child 44 and the sequels on Amazon.co.uk here. 3) SpaceNK’s “discovery” promotion ends tonight. Spend £40, get a tenner back. Not bad, if you need to stock up! My stock-up items would be a bottle of the amazing Philosykos perfume from Diptyque (one of the best fig scents – really green and fresh) or the new Laura Mercier foundation, review here. If you fancy a quick browse before the offer runs out, click here.